04h00 Central African Time: I stumble out of bed and immediately go to look for the chicks. I find Timka sitting peacefully on the balcony pillar. As per yesterday morning, I can't find Merlin anywhere. 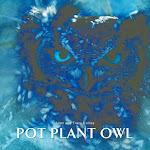 Pot Plant Owl is on the neighbour's roof, so I know that Merlin is near. Eventually I spot Merlin - walking along the wall that separates our complex from the next one down the road. Allan and I watch Pot Plant Owl and Pappa both try to lure Merlin away from the wall and back to towards our house, and the nest. As I watch Merlin, I realise there is a problem. Somehow little stinker Merlin has got between two electric fences - the one on our complex wall, and the one of the other complex. Merlin can't find a way through the fences, and the fences are live. I realise that we have to get Merlin out, so under an umbrella and carrying a garden chair, we make our way through our neighbour's garden to the wall. I stand on the chair to reach Merlin, who is beak snapping furiously by this stage, attracting PPO's and Pappa's attention of course. I reach through the one fence to grab hold of Merlin, but Merlin has other ideas. A power struggle ensues between owlet and human - all the while the crackling of the electric fence sounds ominously. PPO and Pappa don't even launch an attack. They must know that I am trying to get little stinker out of a tight situation. Merlin is feisty - too feisty for its own good - and falls off the wall and into the complex next to ours. We are very aware of owl superstitions that are rife all over the world but especially in Africa. 'If an owl lands on your roof, someone close to you is going to die' - that sort of thing. Owls are attacked, stoned, burnt to death - it is horrible. For this reason, and not knowing what sort of domestic animals and dangers there were on the other side of that wall, we decide to go to the next complex and find Merlin. All this happens before 6am. It is a long wait at a closed gate that doesn't open. Eventually, an early -riser drives out and we get access into the complex to find Merlin. Cut a long rescue short: I find Merlin hiding under a small bush. It takes me a few minutes to get us both back under an umbrella (PPO and Pappa out and ready to attack after Merlin's beak snapping), and we drive back home together. A very surprised, bot hopefully happy, PPO flew into the balcony just as I released Merlin. In a last act of defiance, and confidence boosted by Mom's arrival, Merlin turns towards me with wings open wide and lots of beak snapping. Soon, Merlin joins cute Timka on the balcony pillar - no doubt sharing its adventures with its sibling. Merlin the brat chick ! He really made you sweat. I am happy you avoided the electrocution. Bravo to overcome all these ordeals. Never a dull moment in the Kingdom of PPO. Human parents are great. Gutzy little guy! Thank you for the rescue! They are so cute together there on the pillar! That wee Merlin is really an adventurer isnt he.